I recently started a new blogging group for people who love their printed cookbooks as much as I do. 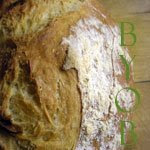 Cookbook Lovers Unite will have a theme every other week to make a recipe from a cookbook and then blog about and share. The first theme is "Your First Love." I wanted to hear what books started the obsession for other cookbook addicts. My first cookbook love wasn't the first cookbook I ever owned. It wasn't even the second or third. Just as your first love isn't necessarily your first date, it took a few books before I found the one that started it all. The Horn of the Moon Cookbook started it all for me. I'm not sure why. It's such an unassuming book. The cover is a drawing. There are no pictures in the book at all--just some line drawings and text. The author is not a celebrity. No one was promoting the book in a magazine, on a display in front of the store, or with a show on The Food Network. Nope, it was just a regular old book on a used bookstore shelf, and somehow it caught my attention. It was the weekend of October 18-20, 2002 when I found the book. I know the date because it was my one-year anniversary with my boyfriend (now my husband). We had gone up to Vermont to see a concert, and stayed with friends who lived in Burlington. While we were wandering in downtown Burlington, in the bitter, biting wind, we ducked into a used bookstore. While browsing, I spied The Horn of the Moon, and something drew me to it. I bought it, after consulting with my boyfriend, not knowing that it would change me. I read the cookbook cover to cover in the following months, marking recipes I wanted to try to make. This was no small step for me. I come from a family that doesn't like to cook. That's putting it nicely. My mother CAN cook--and what she makes she makes quite well--but she hates the process. My grandmothers? Don't make me laugh. At my wedding shower, everyone gave me a recipe card with a special dish from her kitchen. I don't have one from my Grandma because she couldn't think of a single thing that she cooks--she just orders take out or (more likely) goes to a restaurant. So, I wasn't from the cooks. But, I was determined to try, and this book was going to be my gateway. These open-face sandwiches were my first foray into the cooking world. Kurt and I made them over and over and over again. We were so proud of our accomplishment. (Looking back, of course, this is an incredibly simple recipe, but we were just beginners.) To this day, the smell of broccoli and thyme sauteing reminds me of our tiny, crammed apartment in Somerville, MA. It reminds me of cozy meals around our tiny table, of cooking in a galley kitchen so cramped that we could barely work back-to-back. It reminds me of brisk November days, walking the half mile to the grocery store, and then walking back carrying the bags, and how warm my cheeks would feel when I got back into the apartment and turned on the stove. This recipe reminds me of the early days of living together, and learning to cook together. It's amazing to me that this one innocent-looking book sparked the cookbook collection that I have now--that the 200-plus cookbooks in my house all sprang from that one impulse buy in Vermont. Here's to beginnings--of a lifelong love of cookbooks, of a relationship that is now nine years old, and of a new blogging group where we can share the joy of the printed cookbook. Heat a skillet over medium heat. Add oil, then broccoli and thyme. Cook 2 to 3 minutes. Add mushrooms and salt and cook until just barely tender. Remove from heat and drain any excess juices. Place bread on a cookie sheet. 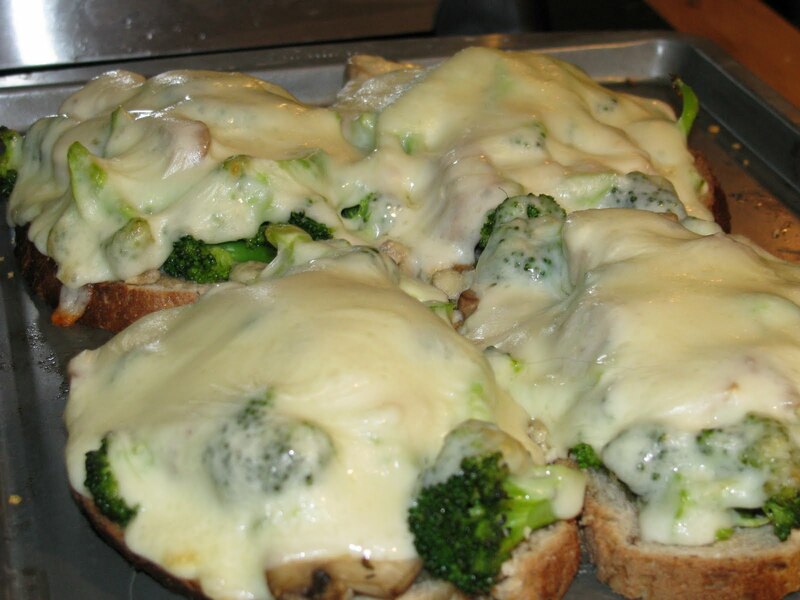 Top each piece of bread with the broccoli-mushroom mixture. Spread the blue cheese over, followed by slices of mozzarella, and then cheddar. Bake for 10 minutes. Serve open-face. Horn of the Moon Cookbook is still one of my favorites! When we first started visiting Vermont (lived here 20 years now), we would often include a stop at the Horn of the Moon Cafe in Montpelier. So sad that due to circumstances it is no longer there on Langdon Street. And the late Gary Beardsworth (Recipes from the Moon), who bought the restaurant from Ginny Callan, told me the secrets for scrambled tofu that tastes great. Be sure to try the recipe for homefries with tofu someday...even the meat-eaters in my family are fans!